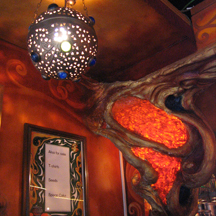 If you can only visit one coffeeshop while in Amsterdam, Abraxis is the one I would recommend. 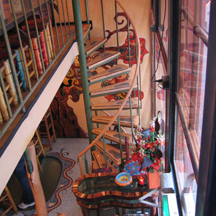 It's hidden in a tiny alley very near the Dam Square (the center of town), and it has 3 floors of wood-paneled hang-out spaces to enjoy. Up on the top floor there's a window into a small, well-lit grow-room, where live pot plants are (usually) on display. This can be something of a thrill to a stoner who's never seen marijuana in anything other than a plastic baggie. (For an even better glimpse of living, growing weed, visit the Cannabis College.) While you're up on the 3rd floor of Abraxis, look for the spot where you can see down through the glass floor of the second level to the entry-way on the ground floor. This is the place where the chairs say "Hello There" and where every inch of the walls is covered with cool funky stickers. 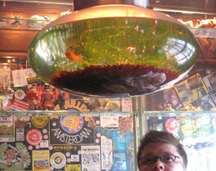 It's small (even by Amsterdam standards) but friendly, and they have large glass bongs you can borrow. Barney's has a couple of establishments very near each other, connected in the back by a shared kitchen. 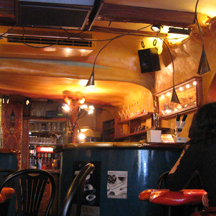 One is a regular restaurant; the "Breakfast Bar" is a coffeeshop. It's a great one to go to first thing in the morning, since they open earlier than most coffeeshops and, of course, they serve breakfast. Also, since they're up near the train station, Barney's is a good place to go when you first hit town and nothing else has opened yet. La Canna is huge (at least by Amsterdam standards). It's got 3 floors, a billiards room, a full restaurant, and rooms to rent. My favorite spot is on the second floor, by the windows. There's this long, low, black countertop you can sit at, with views out the window of the busy pedestrian street below. It's a great spot to play Binary Homeworlds! And they have waitresses who will bring you food! 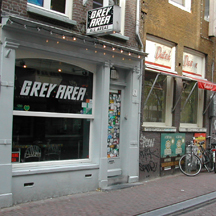 This was the first coffeeshop we went to during our first visit to Amsterdam, in 1997, and as such it will always have a special place in my heart. 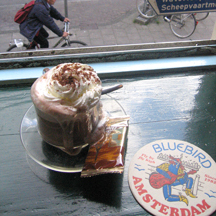 But it's not just the first-time memories that put the Bluebird in my top-ten... it's also just a very nice coffeeshop. If it's too crowded, try going two doors up the street to the Reefer, which is worth checking out anyway if for no other reason than to see the tree made out of old Dutch coins (which were made obsolete by Holland's adoption of the Euro). There are actually 7 or 8 different Bulldog coffeeshops scattered around the city, each with its own distinct style and personality. My favorite is the Original Bulldog, which is the one with the wonderful fishtank light fixture hanging over the table by the window. De Dampkring always seems crowded to me. Partly that's because it's just a really great coffeeshop, but also I think it's because there aren't any other coffeeshops right nearby. This can make it particularly frustrating to visit, since you can't settle for the coffeeshop next door if hike all the way over to De Dampkring and find it too crowded to get into. 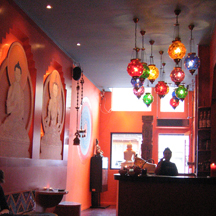 But the decor is awesome! Even if you can't find a seat, it's worth taking a peek inside. 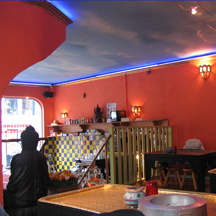 Stone's Cafe has 2 locations near each other in the Red Light District. One is rather large, and more like a bar. 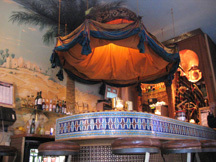 The one I prefer is small and stylish, with a desert-oasis theme to the decor that's very inviting. 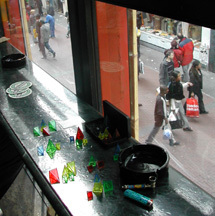 The big windows allow for great people watching on a very busy pedestrian street-corner.